"I probably can't do justice to how well Michael did. He related to children. He had excellent techniques to keep the children's attention. His way was calm and yet exciting. The added touch of giving each person string and beads to wear is an example of Michael's sensitivity. They loved his stories both young and old! Great." "Very good rapport with the audience." "Kept audience active and engaged." "Please repeat during the summer!" "He has a great sense of how to captivate an audience." "He has a special knack for keeping everyone involved and demonstrated super participatory listening skills." "Excellent, used a variety of activities and involved the senses other than just hearing. Clear, well-planned, related well to ages of the audience." "Excellent performance, knowledge of subject matter, rapport with audience, participation of the audience." 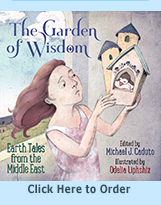 "Held children's attention with excellent use of teacher's voice in storytelling. Great interest and enjoyment shown by children, especially the opportunity for imaginary visualization. The listening skills taught were excellent. A most beneficial teaching lesson as a vehicle of appreciation for our world and nature." "We intend to have him again next year."